When I told friends I was visiting a local cotton farm, I was consistently asked this question. Environmental messaging about cotton has pervaded the community consciousness. I was curious to find out how concerned I should be about this information. This is my first attempt at the topic. As always, it is limited by what access to data sources I have, and my skill set in understanding it. The original source of cotton could have been East Africa and the Americas. What does seem certain is we’ve been using cotton for a long time. 5000+ year old cotton fabric has been found in Egypt, the Indus Valley (modern day Pakistan) and Mexico. Knowledge of cotton spread along with some of the key stories from our history books. Alexander the Great’s troops switched from woollen tunics to cotton when they invaded India. Muslims in Spain introduced cotton to Europe in the 8th century. Cotton became a valued import from India until the 18th century. Then the industrial revolution in the UK shifted production to Europe. There were poor work conditions in British mills and slavery in North American fields. Cotton is a relative of the hibiscus plant. Most cotton grown today are Americas varietals, particularly Gossypium hirsutum; upland cotton. Pima and Egyptian cotton fibres come from a South American variety, Gossypium barbadense. It has fine, soft, long-staple fibers but is harder to grow. Native Australian ‘cotton’ Kapok/Goonjan/Wanggu (Cochlospermum fraseri) in the Northern Territory. The fruits split to release numerous seeds on silky parachutes of a cotton-like fibre. In Australia, cotton came out with the first fleet. There are some native ‘cottons’, but they are not grown commercially. It puttered along as a minor crop in Queensland from the 1850s. This was unirrigated, marginal yield and poor quality. There are hints of an ugly story here too. Over 60,000 South Pacific Islanders were brought to develop the cotton and sugarcane crops. Was blackbirding involved? The modern, irrigated crop we know was an innovation of the 1960s. Cotton was the first genetically modified (GM) crop to be grown in Australia in 1996. Today 98% of the Australian cotton crop is GM. CSIRO partners with Monsanto to breed cotton varieties suited to different regions in Australia. One of those varieties is Bollguard II. It contains two genes from the soil bacteria Bacillus thuringiensis (Bt). Those genes produce proteins in the cotton leaves, killing caterpillars of cotton’s biggest pest. Because of this, Australian cotton has the highest yields in the world. I have been unable to locate any organic cotton growers in Australia. It would appear that growing organic in Australia is commercially unfeasible. The cotton growing season in Australia falls between September and April. Victoria’s season is shorter and finishes in late April or early May. The plant grows to about 1 metre tall. Lovely cream and crimson pink flowers give way to bolls. The bolls split to reveal cotton fibre inside. During the growing season, fertilisers, pesticides and herbicides are applied to the crop. Once the cotton bolls open, defoliant is used before harvesting. This list breaks down the actions at each stage in more detail. This video shows the different stages (and machinery used) for cotton growing. It focuses on New South Wales, so some of the techniques are different to Victoria. Australian farms average 10 bales of cotton per hectare planted. Each bale contains 2,500kg of cotton lint, seed and vegetable matter. Yes. Cotton uses a lot of water. About 7 megalitres per hectare; which grows at least 10 bales of cotton in Australia. A farmer told me that 40% of a bale is lint (cotton fibre), so that gives us about 10,000kg of cotton per hectare. Australia’s crop is considered the most water efficient in the world. So if water efficiency is important to you, Australian cotton is worth considering. But should we be growing cotton in the first place? Cotton is a large water user when compared to other clothing fibres. So cotton as a clothing fibre doesn’t rate well for water concious consumers. But when compared to other crops grown where cotton is farmed? The story changes. Cotton uses less water than lucerne and tomatoes: popular crops in Victoria’s irrigated areas. Cotton is also a lucrative crop. From a farming perspective then, cotton makes the most out of available water allocations. Speaking of irrigation, I wondered about the environmental impact of having an irrigation system. I spoke to Juliet Le Feuvre from Environment Victoria. I asked her if it’s possible to irrigate in an environmentally responsible way. She thinks it is, although we’re struggling to balance the competing needs well. She pointed me to the Murray-Darling Basin Plan for information on our current approach. Lake Boga at sunset, part of the Victorian Mid-Murray Storages. Chemicals on cotton involve insecticides, fungicides, herbicides and defoliants. I’ll refer to these generally as pesticides. Insecticides are applied to stop insects destroying crop plants. Australia’s use of GM cotton varieties has reduced insecticide use by 85%. In 2010-11, that meant 0.54 kg of insecticide active constituent per hectare. Fungicides kill or prevent the growth of fungi and their spores. The only fungicides registered for use on cotton in Australia are for seed treatments. Herbicides kill unwanted plants. Of all the herbicides used on cotton, more than 80% is glyphosate (Roundup). In 2013, herbicide useage was just under 3kg of active ingredient per hectare. Seven glyphosate resistant weed species occur widely in cotton farming systems. It’s interesting to note that irrigated systems provide higher weed control than dryland systems. Defoliants cause plant leaves to die back and drop off. This reduces the leaf and vegetable matter in the cotton when harvested. Defoliants could use chemicals that also have insecticide or herbicide qualities. Defoliation makes processing easier and maintains the quality of the fibre. chemical run off and spray drift (when pesticides move away from their intended target). Beneficial insects are being better supported by Integrated Pest Management Systems. This uses a broad range of strategies to control problem pests including targeted insecticides. Integrated Weed Management is helping control weed resistance. The cotton industry has significantly reduced the impact of pesticides on the environment. Tools like MyBMP will help the industry to keep doing so. But pesticides do continue to have an impact on waterways and vegetation. Cotton is hard wearing and durable, but soft on the skin and hypoallergenic. It’s spun as a combed or mercerised yarn. Combed cotton is brushed, matte and low-twist. Mercerised cotton is treated with sodium hydroxide for a shiny finish and high twist. The fibre provides little insulation, high breathability and absorbs water. This is why its such a comfortable fabric in warm weather. Most cotton is white; it can have shades of yellow depending on the variety grown. There are also coloured varieties of cotton in red, green and brown! Cotton fibres vary in length from 1 to 6.5 cm, with a diameter of 11-22 microns. Cotton fabric has good drape and high pilling resistance. The smoothness of the fibre defines stitches, good for showing off fancy stitch work. Mercerised cotton has superb colour retention. Cotton is inexpensive, and can be washed and dried on regular machine cycles. It can help to lie the garment flat to dry, to avoid stretching it out of shape. 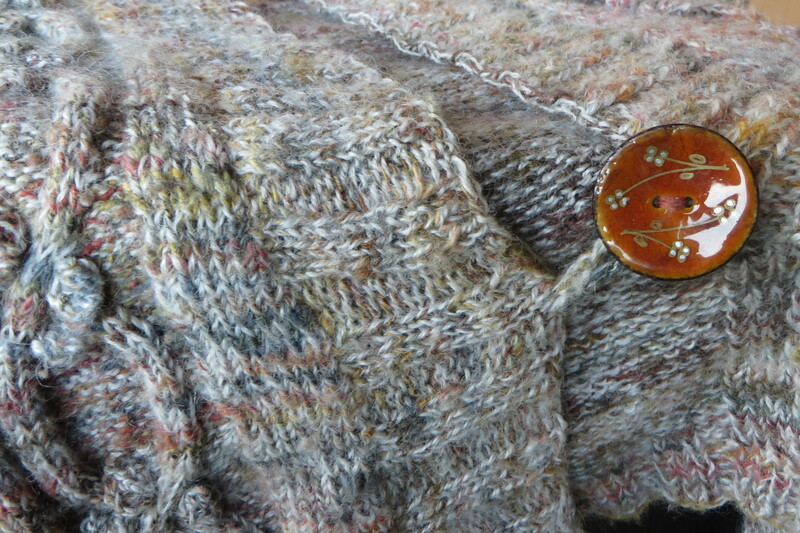 Some high twist cottons, particularly mercerised ones, can knit on an angle. Cotton yarn is prone to splitting during knitting. Cotton’s good stitch definition shows up all your mistakes. That’s a concern for inexperienced knitters like myself! Cotton fabric is inelastic, so it is prone to stretching and sagging. Blended yarns improve this tendency. Cottons dyed in dark colours tend to bleed. Adding vinegar to washes reduces colour running. The colours tend to fade in brushed cottons, they can also be prone to pilling. Be careful around flames, because cotton is highly flammable. There is no easily sourced organic cotton available in Australia. Linen to me is teatowels and 1980s dresses and suits. It’s so synonymous with domestic fabric that we call our storage space for it a ‘linen closet’. Linen comes from the inner fibres of flax plants. It is the strongest of all plant fibres. Like sheep, linen was first domesticated in Mesopotamia. The oldest known piece of clothing is made of linen. We’ve been using this fibre for so long, it’s embedded itself deep into the English language. Line, lingerie, lining all have historical roots in linen. What I’ve discovered is that Victoria has a special history with linen. In WWII, the British lost access to their normal sources of flax in Russia, Belgium and Ireland. Flax was used in coats and parachute harnesses, ropes, tarpaulins and glider covers. All important things for the war effort. The Brits told Australians to step up and gave Australia a quota. By 1942 that quota was 32,000 acres. Victoria’s share of that quota was 28,000 acres (a big jump from the 2,000 acres grown in 1930). Farms in places like Hamilton, Colac, Berwick and Drouin contributed flax. There were 10 mills and six deseeding depots at places like Drouin, Lake Bolac and Myrtleford. The Australian Women’s Land Army helped grow and harvest the crop. Sheep helped too, eating weeds in flax fields. There are at least two varieties of flax plant: one grown for seed, the other for fibre. The varieties are specialised because growing for seeds reduces the fibre quality that is harvested. A 1.5 x 5m patch of flax will yield about 350gm of fibre. Flax harvesting is a labour intensive process with amazing terminology. The entire plant is pulled up, or cut close to ground to maintain the length of the fibre. Plants are dried, then retted with water, dew, or chemicals (an alkali or oxalic acid) to loosen the outer stalk. Scutching removes the stalks. Tow is a byproduct of scutching, which can be used as upholstery stuffing. Heckling then combs the fibres ready for spinning. Flax can also be processed faster by ‘cottonising’, which uses cotton machinery. The resulting linen looses its characteristic look. There is an environmental impact to flax. Growing it can involve pesticides, because flax won’t grow well with weedy company. The production of linen can include chemicals. Light weight and cool, linen is also soft against the skin. It can be machine washed, dried and take hot temperatures. Linen has only moderate initial shrinkage. It improves with washing and age. The natural colours of linen range from creamy beiges to light blue-greys. (Remember the girl with the flaxen hair?) It is not naturally white, this comes from bleaching. The finest linen fibres are smooth with high lustre; lower grades can be wrinkly and slubby. Linen doesn’t take colour as well as cotton, but its lustre boosts the dye that does take. Linen fibres measure around 25-150mm in length so it doesn’t pill. The fibre averages 12-15 microns. Linen wrinkles easily. If it is creased regularly along the same fold, the fibre will weaken in that area. Linen has no crimp which gives it a lovely drape that doesn’t sag. It breathes well and conducts heat away from the body. Linen absorbs and then looses moisture quickly, so it doesn’t tend to feel clammy when wet. It is anti-static and hypoallergenic. Linen is damaged by perspiration and bleach. It is resistent to moths, carpet beetles, dirt and stains. I’ve seen conflicting claims of mould-resistance and susceptibility to damage from mould. Linen is an expensive fibre, so it is often blended with other fibres to lower its price. It’s not a warm yarn, but it can be blended with wool or alpaca to make it suitable for inter-season garments. The biggest downside for our local Fibreshed is that I cannot find anyone growing this fibre commercially. I have learnt that Stoney Creek Oil do grow the fibre variety of flax. They grow for seed, so it isn’t suitable for clothing. I’ll admit, before starting this project, I thought alpacas were just trendy pets. I’d only ever seen alpaca pairs in small farm fields as I drove past. Perhaps they were a fad, like emu farms. I did know they are useful guards. My uncle lends his alpacas out as protection for lambs. Alpacas help guard goats and chickens as well. Huacaya alpacas celebrating the 25th Anniversary of the Alpaca industry in Australia, at City Square in Melbourne. Now that I’ve been to some alpaca farms, I’m much more impressed. Alpacas were first bred by the Andean people in South America up to 6000 years ago. They are part of a family of camelids including llamas. There are two kinds of alpaca. Huacayas are the cuddly looking kind that we’ve seen most often. The suri looks a little like an afghan hound with its long locks. The Incas prized suri and reserved it for royal clothing only. Alpacas take a long time to make babies. The average gestation time is 11.5 months! A baby alpaca is called a ‘cria’ and they look as cute as they sound. This is part of the reason alpacas are so expensive: it takes time to get more alpacas! Suri alpaca celebrating the 25th Anniversary of the Alpaca industry in Australia, at City Square in Melbourne. Alpacas have a lower impact on our environment because they have soft foot pads. They tend to eat a little of everything, allowing plants to regrow between nibbles. They’re free of health problems like foot rot, fly strike and Johnes’ disease. They need one or two annual vaccinations. They do sometimes suffer from vitamin D deficiency. The only place they can absorb the sun is their nose. Alpacas come in 16 natural colours. They can be black, bay black, white, four kinds of grey, three kinds of brown, three kinds of fawn or combinations of those colours. I know that’s not 16 colours, I’m not sure what the others are 😉 Alpacas need to be shorn once a year, this is usually done before summer. They are usually shorn lying on a table, and it takes between five to 10 minutes for each alpaca. 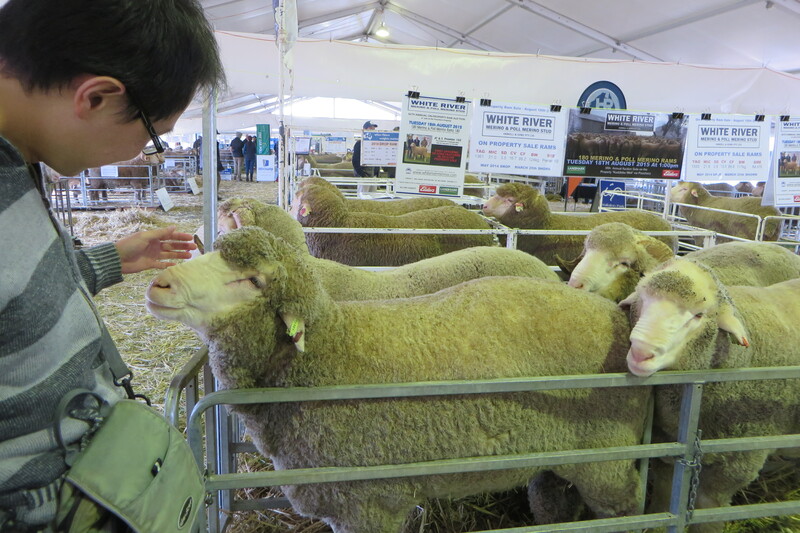 Depending on the quality of the fleece, you can get between 1.5 and 4kg of fleece per animal. Alpaca fleece is low in lanolin – the oily substance that coats some animal fibres. This means the fleece is hypoallergenic. There’s the added benefit that low lanolin levels need gentler cleaning during processing. I’ve heard that alpaca shearers lubricate their cutters more often because there’s less lanolin! 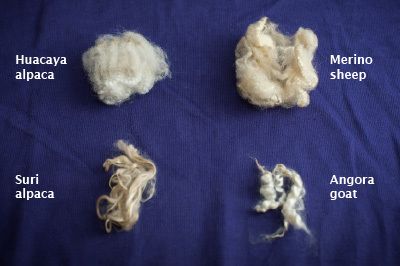 Alpaca fibre is the same or a little less durable than wool (depending on who you talk to). Each fibre is hollow, which traps air and makes the finished product warm to wear. 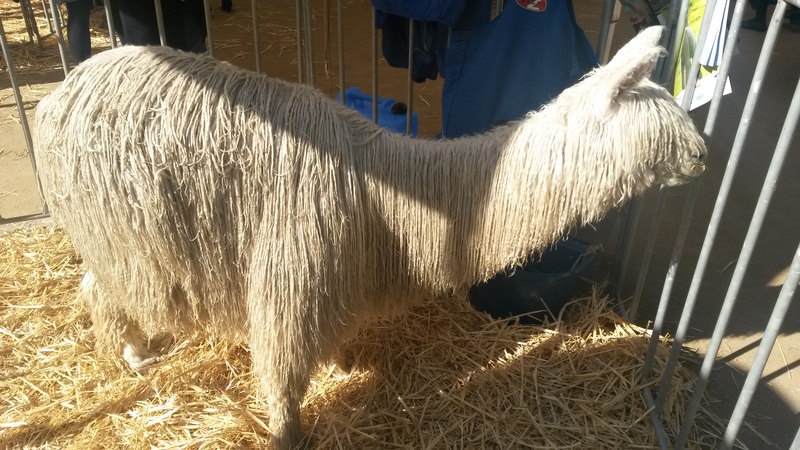 Alpaca is less elastic, so garments drape well, but may not keep their shape over time. Some people knit at a higher tension to reduce this problem. Its possible to blend alpaca with wool to give more elasticity. Suri fleece twists instead of having an elastic crimp. This is what gives suri the lustrous, slippery qualities that I admire. Alpaca doesn’t pill (yay! ), but it does shed. It’s also a soft fibre; suri fleece is even softer than huacaya. The fineness of fibres is measured in microns. One micron is one millionth of a metre. 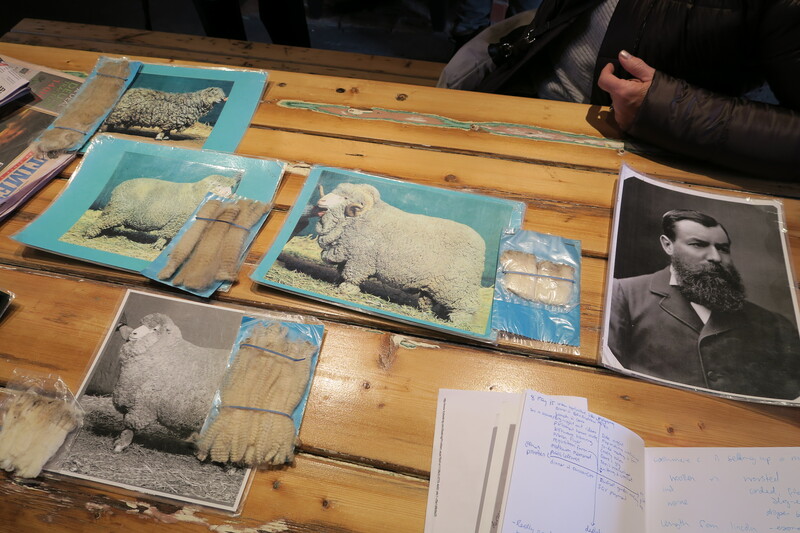 Alpaca can measure as low as 15 microns, which puts it in the same realm as superfine merino. More often, alpaca comes in at 27-28 microns, perfect for fashion fabrics. 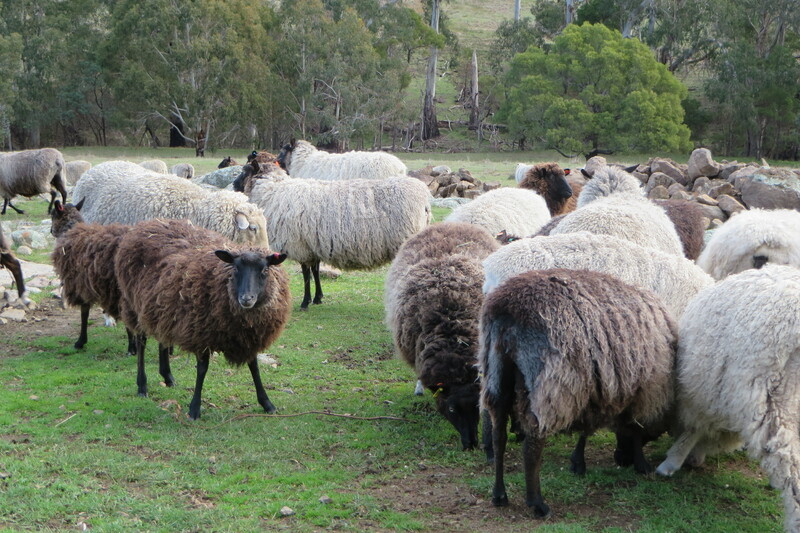 Creswick woollen mills make socks, jumpers and scarves with alpaca. Rugs sold here are often produced in New Zealand. Coats and other garments are often produced in Peru. They have more expertise and resources for these products than Australia. Alpaca is also used as a quilt filling. 28-36 micron fibre is used in carpet. Amazingly, there is a carpet maker in Victoria making carpets with alpaca fibre! Sounds pretty amazing. Why wouldn’t you use alpaca all of the time? …because no product is the answer to everything! Alpaca is a growing industry. It’s made up of many small farms of varying quality and range of colours. 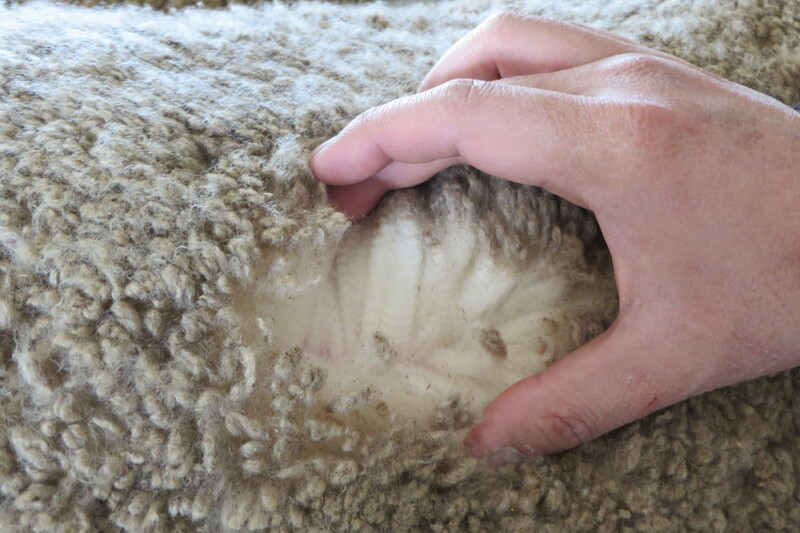 It’s hard to get commercial quantities of fleece in a consistent level of quality. Alpaca is currently a niche product, with an expensive price tag. Where can I see alpacas locally? 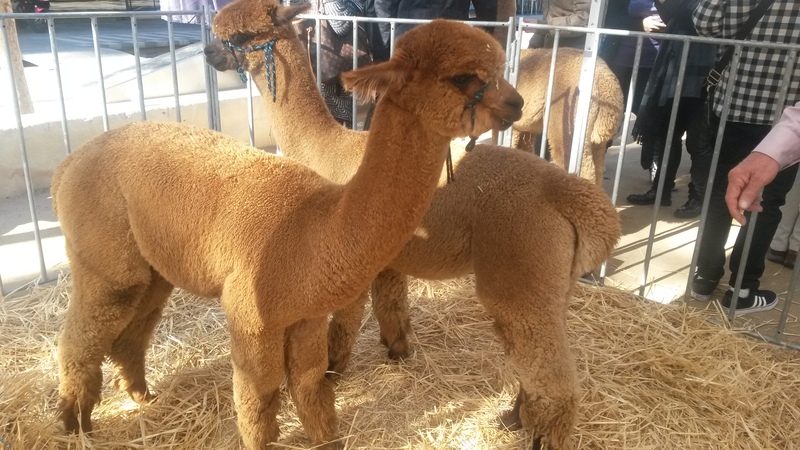 Fresh field alpacas – Somerville, Mornington Peninsula.